I remember the days when they used to give bats free with Boost/ Milo and other health drinks. The first thing i would do is take off the sticker, take my red sketch and write MRF in bold on the bat. When i get down to the ground with the bat, I felt proud and confident. Not that i like the tyre company but whenever i think of Sachin, i remember the plastered bottom MRF bat that sends the ball rolling down between the umpire’s legs for a boundary. All those stickers that i collected and all those prayers for you to get back after your tennis elbow injury. Countless memories of the stylish boundaries, that smile after taking occasional wickets, that bracelet on your right hand that dances in the air when you bowl those wonderful off cutters. Its all fresh in my memory. There is not just one reason to call you a legend. There were a lot of bowlers who were daunting to the opposition but not you. A bowler was rated based on how less you scored against him. Seasons changed, years passed. We saw Wasim Akram, Waqar Younis, Shoaib Akhtar, Allan Donald, Glenn Mcgrath, Muralidharan, Shane Warne and lot of other top notch bowlers getting hit in all directions. And ofcourse the smile when someone picks up your wicket. Thats when i learnt to smile after getting out. I used to practice smiling like you before the mirror. There are a lot of people who say its all over-rated, it is just a game and you are just another player who graced the game like other greats. But to be the game’s mascot for 24 years is no simple thing. Even the Olympics which has more than 100 games changes the mascot every time. But cricket had one – No – has one. We switch off the TV when you get out and then switch it on again after some time thinking how will India come back into the game. Comparing you to God is logically correct as whenever you score a century you look up to God to thank him and when India needs to win the game, the nation looks up to you and you win it for the country and we are thankful. In all these 24 years, you haven’t endorsed a brand related to Tobacco or alcohol. That shows your contribution to the well being of the citizens of the country. Some say its just a form of entertainment. No it isn’t, its a sport which is loved and played by billions of Indians because of one person. Movies are Entertainment. Not everyone gets to act on a day to day basis. But there were no evenings without taking the bat. The only reason India has got a lot of batting talent than bowling is solely because a lot of people chose bat over the ball because of you. When the whole nation is watching you, there is a huge pressure to perform and every boundary brought a smile on our face and you scored not one but two but 100 centuries. You are the reason for atleast half of the players in the current team to take the bat. When you were carried by your team mates around the ground, that pride on your face made our hearts warm and I actually felt i shared the happiness with you in bringing the world cup home after a long wait. That moment when you raised your bat today when you walked back to the stands and the cheer. I am sure all the ones in Wankhede would have shed a tear or two. We have all grown up and a lot of things have changed since the time we were born. But one thing hasn’t – The hope that Sachin will win games for India and it will be a pleasure to watch you play. 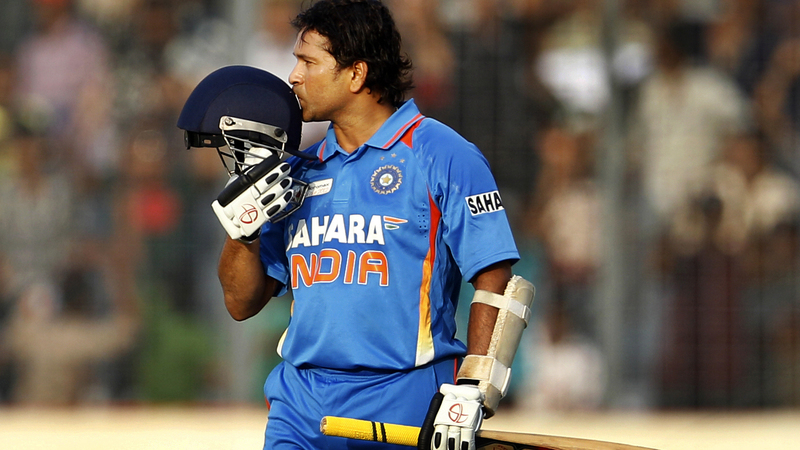 We will miss you Sachin and we were lucky enough to watch you play.